What makes family gatherings and celebrations special? In the U.S. most of us don’t live near all our extended family (adult siblings, aunts, uncles, cousins, and maybe even grandparents). It can be great just to see them, talk and eat together! Family stories can help the extended family, as well as individual parents and children, connect on a deeper level. In this issue there are several articles with helpful ways to do that. Then there’s an explanation of some of the vocabulary used, including several idioms and some possibly-confusing expressions, and some informal words for family relations. There’s also a link to some basic family vocabulary in English in case you’d like a review. I love the idea Priya Parker shared for an unforgettable family gathering. She wanted to encourage closer ties at a big family gathering—to not have her relatives split up by generation or just retell stories they had already told over and over. So, she asked family members to tell a story about themselves that no one there knew. The stories were rich and surprising. They learned about the courage, resourcefulness, and wisdom of grandparents and aunts they had known only in their older years: a grandmother who had managed, with her father’s help, to go to college when all the neighbors felt it was no place for a girl; a now-silent grandpa who had been an enterprising businessman… It’s well worth reading! The Atlantic talks about the value that children get from hearing family stories. It points out "Books contain narratives, but only family stories contain your family’s personal narratives. Fortunate children get both. They hear and read stories from books to become part of other people’s worlds, and they hear and tell stories of their family to understand who they are and from whence they came." 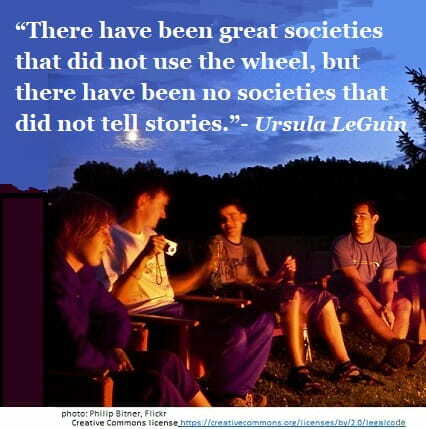 In addition, parents can tell stories in the dark, or when they don’t have a book with them. Children don’t have to sit still for long minutes to listen. Best of all, parents can tell stories about themselves that relate to just what their children are going through right now, giving perspective and strengthening bonds between them. This HuffPost article tells the author’s story of how she met her husband and why their anniversary is worth celebrating. Then she suggests many other occasions for small celebrations that can make treasured family memories. It’s a happy article with lots of interesting ideas. An anniversary is a commemoration (remembrance of) a date when something important happened—most often the date on which a couple got married. A blind date is going out for a date (see below) with an unknown person suggested by a friend or arranged by someone else. A bucket list is a mental list of things a person wants to do before they “kick the bucket” (die). A curve ball is a baseball thrown in a special way that makes it drop lower as it gets near the batter, so that it is difficult to hit. The Atlantic article says “Even older adolescents still benefit from their parents’ help in understanding life’s curveballs.” Here ‘curveballs’ are experiences that are difficult to handle and accept. To date is to go out with someone for a meal, a movie, etc. Its ultimate purpose is to consider a person’s suitability for marriage or some other romantic relationship. To gather is to come together or bring things together. We can gather information, ideas, or flowers, as well as bring relatives together in a big family gathering. “Just because” is doing something because you want to, without having a specific reason to do it. To ‘nail an audition’ is to do well on an audition (try-out for a part in a play, movie, musical group, etc. by demonstrating the needed skills). Relatives are family members including the extended family (uncles, aunts, cousins, in-laws). To reminisce is to think back over life, remembering happy moments. A report card is the notice American schools send to parents several times during the school year with children’s grades (marks) in different subjects: a report on the child’s progress. We also sometimes shorten other words, for example ‘sis’ for sister, ‘cuz’ for cousin. If you want to review basic family vocabulary, here’s a clearly arranged list. This is a very busy time of year for many, so there won’t be an English Detective issue in two weeks. The next issue should go out on Jan. 1, 2019—just in time for the New Year.